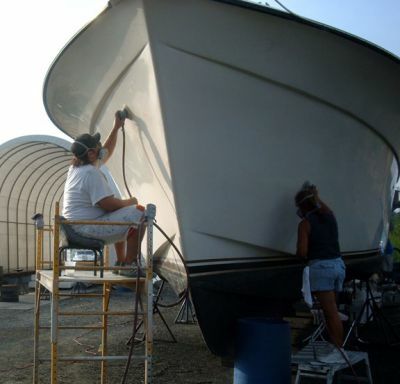 October 2014: Alliance Marine did a great job Polishing and waxing the hull and house. What a difference! Nice people to deal with. 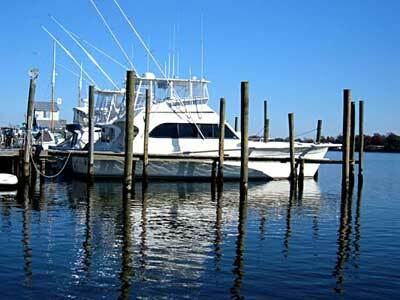 We began by taking some photos of the boat. 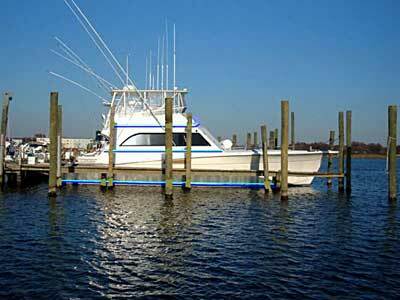 Ideally, we should have moved the boat to the outside slip so pilings would not interfere with the photos. With some magic on the computer you can get an idea of what things will look like. Note that I have changed the window shape slightly on the aft lower edge. I think it gives a better look. 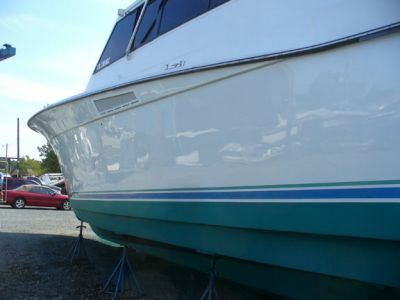 We have also created boot stripes, house stripes and bridge stripes. This is a fun exercise that should be done before really painting. 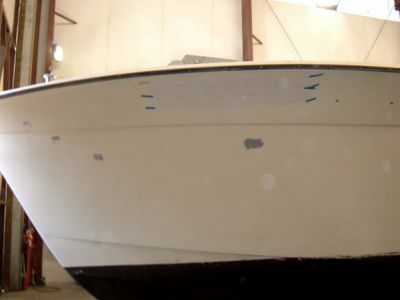 Stripes and or colors can change the whole attitude of the boat. 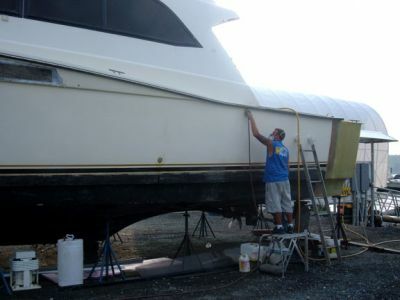 Done properly it can make the boat look sleeker, faster, a large house look smaller, a bad angle look better, etc. Think of it as make-up and the right dress on a woman. This is a hard working crew! The extension has been mudded and faired in and will now be shot with primer. Primed! This baby is looking longer. 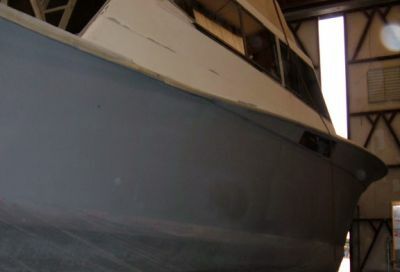 The starboard side of the addition has been primed. While you can not see the penciled name on the paper, it is there. 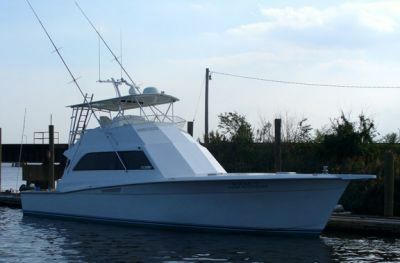 'EZ2CY with AQUA EPICUREAN" is 5.5 feet long. Stacey thought it might look too big, but I don't think so. 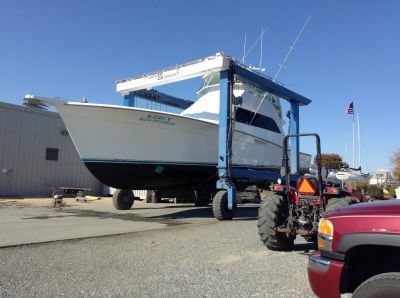 The name is dwarfed by the hull which now measures 57'. It measures 60' with the bow pulpit! 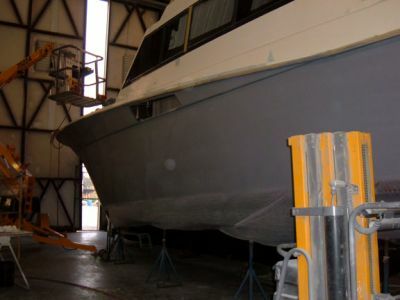 The hull is primed with gray primer. 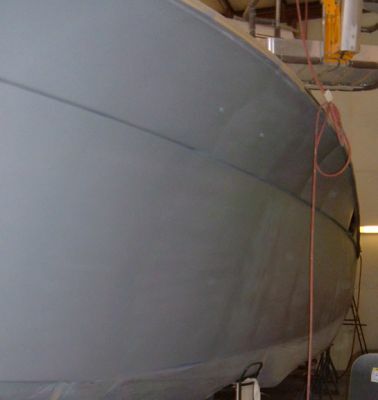 Port side primed. She is a big battleship. 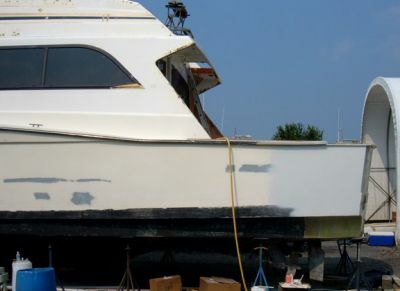 We marked the boat and moved the aft bottom paint up one inch and the forward up three and a half inches to compensate for the flotation afforded by the new addition. 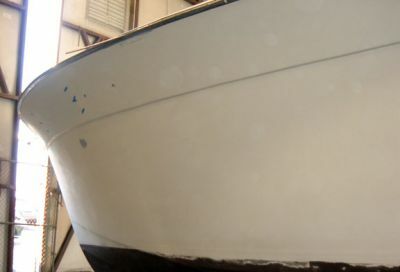 One inch of white paint spaces the 2 3/4" metallic blue stripe from the bottom paint. 3/4" of white separate the blue from the aqua 1" stripe above it. 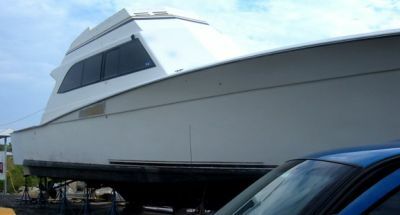 Now she is level and lookin' good.